Archie's colourful career included spells at St Mirren, United, Hearts, Falkirk, East Fife, Manchester City and Rangers. He was with Falkirk at the time he signed on at Tannadice and went on to play for United for just over two years. He was well-known as a skilful forward. Archie was released in April 1957. 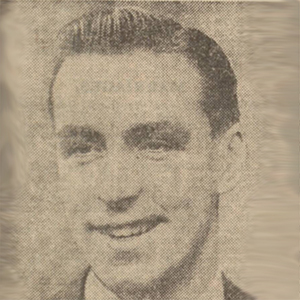 Following his retirement, he became part of Arthur Montford's Scotsport TV team for several years. Archie was born on this date in Falkirk. We took the lead in the first half, somewhat against the ron of play, when skipper Davie Cross carried the ball up field and lobbed Barrie. Brechin, however, provided a rude awakening as they quickly overhauled that lead. It was then Archie Aikman stepped in. A forty-yard solo run ended with Archie Aikman cracking in his first goal for the club. Better was to follow. Former clubmate Jimmy Dunlop slipped Archie a pass, and Archie Aikman went on to score his second and a valuable winner which took United above four clubs.